It was so sad to hear that Toby Nye our little Leeds fan had lost his battle with Neuroblastoma last weekend. As soon as I heard the news the tears were streaming down my face, as I felt the pain his family will be suffering having lost a child too. It was great to see the tribute before the game with Evie who goes on our coach and a Stoke fan holding up a City shirt with Toby’s surname on the back. He also got a rousing send off on six minutes from the whole stadium which was very moving. RIP Toby and my thoughts are with his family. Well Leeds United and in particular Marcelo Bielsa have hit the headlines well and truly this week after #spygate watching Derby County train. What a mountain out of a molehill and sour grapes from Lampard, what a whinger. After seeing the FA and EFL were going to investigate this, Bielsa showed his integrity and honesty by giving the whole world a 90 minute PowerPoint Presentation on Derby. He knows more about Derby than Lampard ever would and you know something, he’d found all that out long before the training ground incident. The bloke found, was even on public land and didn’t do anything wrong. I love Bielsa more and more and he so reminds me of Don Revie. He loved his dossiers too and if Bielsa can emulate Revie in any way, which I do believe he can, we are in good hands going into the future. Don’t ever change Marcelo Bielsa because you are a breath of fresh air especially after all the corruption that has been going on in the game for years and the prima donnas should take a leaf out of your book. They may even learn something!! I went on a First Aid Training course this week and as usual was wearing my Leeds things. 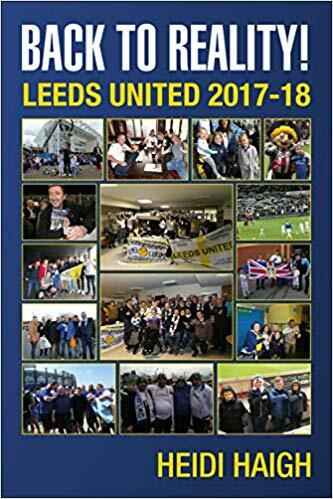 I would like to thank Des for buying The Sleeping Giant Awakens, Leeds United 2016-17 and Back to Reality, Leeds United 2017-18 (a big thank you to my friend Sue for getting the latter one too). I would also like to thank Andy for buying Follow Me and Leeds United for Harry. I look forward to receiving feedback from all of them. Des had already bought the first three books I’ve written and it was great to get the feedback that he enjoyed reading them all. The funny thing on the course was being asked if anyone wanted to be a trouble maker whilst someone else was performing CPR; well I had to volunteer didn’t I? I can be a pest, never stop talking and also can definitely relate to it despite never wanting any trouble near me. I have to say all the others on the course wanted me to be shut up lol!! They’ve never had anyone quite like it I think and I couldn’t stop chuckling to myself afterwards. As we headed to Stoke I couldn’t believe that there were still loads of media outlets and failed pundits sticking their oar in about spygate. With false accusations still being peddled left, right and centre plus references for us to be docked three points it is about time they all grew up! Leeds have done nothing wrong and if teams don’t want anyone to watch them play, don’t do it in public but behind closed doors! I fell asleep on the way to Stoke and opened my eyes to see all the fields covered in snow and not much visibility so I was glad I was on a coach. Luckily our snow at home had melted by the time I left to go to Leeds. After a stop in Leek we arrived at the ground only for me to realise that it was a new ground for me after all. Having visited the Victoria ground numerous times I’d forgotten they’d moved. Their old ground hadn’t been a happy hunting ground for us many times football wise especially losing our 29 game unbeaten run there on 23.2.74. Our fans having a laugh despite losing 6-2 and 7-2 two seasons running. My own recollection of getting ambushed at the graveyard when going back to the station and our fans singing Daily Express to me, Sue, Carole and Linda on 13.9.75 when our photo appeared in the paper. This iconic photo taken outside the West Stand showing the facade is the front cover of my first book Follow Me and Leeds United. Is there any wonder I hate red! The team: Peacock-Farrell, Ayling, Clarke, Jansson, Cooper, Klich, Forshaw, Roofe, Hernandez, Harrison and Alioski. Subs: Roberts for Harrison (61) and Jordan Stevens making his debut for Klich (76). Leeds lost the game 2-1 with Alioski getting our consolation goal (90+5). Attendance was 28,586 with 2,919 Leeds fans. As soon as the game kicked off we got covered in beer courtesy of a Stoke fan at the other side of the divide, was there really any need for that? It didn’t take long to realise we were up against it from both the officials and Stoke. In the first few minutes their player dived as if he had been shot right in front of the linesman who instead of being reprimanded was awarded a free kick. I could see that Stoke wouldn’t be a pushover though as they looked very strong. They had just replaced their manager so teams normally up their game for that reason but also when they play us. We were still able to move the ball around well as we tried to build an attack and sometimes we were very successful in tight spaces but not all the time. There weren’t many clear chances for us but we came close a couple of times. When Stoke were awarded a free kick outside the area Peacock-Farrell was lining his wall up. When he crouched down to get a good look, I wondered if he had received some pointers when warming up before the game from our goalie Kiko Casilla signed from Real Madrid this week. He made a great save tipping the ball over the crossbar and also made another good save to deny Stoke. I still had high hopes at half time as we went in level that we could get something out of the game. As I took my glasses off at half time one of glass lens fell out so I couldn’t wear them for the second half but hoped all the play would be coming towards us with Leeds attacking. Unfortunately within five minutes of the second half starting Stoke took the lead. We had cleared the ball only for it to be headed back into the area by one of our players which resulted in Stoke getting the ball into the net. That was a shame because it meant we were up against it once more. We did have a chance to get back into the game when Hernandez was fouled just outside the box but the referee just ignored it. I couldn’t believe it especially as Stoke nearly got a goal from the breakaway. Even I saw the blatant handball from their player which got a deserved booking. As Stoke broke away they looked to be through on goal only for Jansson to make a great tackle at the last minute to deny them a scoring chance. The game took a bizarre and unwelcome turn as Jansson was chasing back and went down as the Stoke man shook him off and Peacock-Farrell made a great save to deny them a second goal. The referee once again showed his true colours with a terrible decision sending Jansson off not before giving Stoke a free kick outside the area! A disgraceful decision despite the referee trying to indicate that somehow as he fell Jansson handled the ball? As Pontus was being escorted off the pitch he took his shirt off and headed to the Leeds fans but had to shrug the stewards off in doing so. He gave his shirt away and looked to be having all sorts of issues with the stewards and I’m sure I saw someone manhandle him in the tunnel. 15 mins from the end just after Jansson received his marching orders I decided I’d make my way over to the left of the stand to get my flag. I managed to get across two sections and then had to force my way down the steps where there was no space to do it due to all the fans stood on them. After a battle I made it to the bottom and we were unlucky not to score when Ayling’s header was saved by their goalie. Stoke then got a second goal to put the game beyond our reach despite Alioski getting a goal back at the death. If it wasn’t for us being reduced to 10 men I think we would have got a draw at least. I took a photo of a very happy little boy with Pontus’s shirt and thank you for making the effort for him to get it. As we were starting to leave the stand some Leeds fans got very agitated with a Leeds steward accusing him of obstructing Pontus. I wasn’t sure what it was all about at that time when someone asked me what was happening. Despite the loss we remain at the top of the Championship. Let’s hope we get back to winning ways next week at Rotherham. See you there, LUFC – Marching on Together.